The round robin is complete and it'll be a Boissevain vs Ste. Anne final Saturday night at the IcePlex. Game time is 4:30 p.m.
March 29, 2019 - Provincials Start Tonight in Morris!!! The Morden Redskins start their next step towards the Hockey Manitoba Senior A Provincial Championship with a meeting in Morris tonight versus the Ste. Anne Aces. Game time is 8 p.m. Make sure to come out and cheer on our champs! To view the entire Senior Provincials Schedule, click here. Morden Wins SEMHL Championship With A 5-3 Victory In Game Seven! 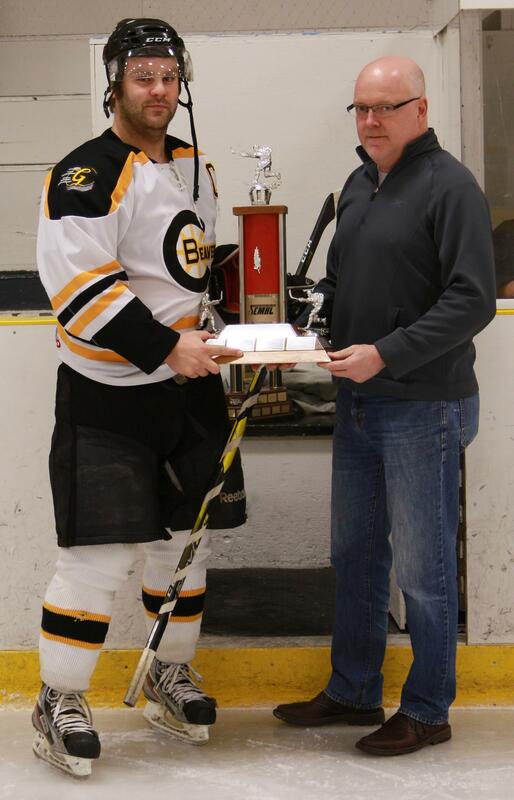 Redskins captain Jay Fehr accepting the league championship trophies from SEMHL Commissioner Tom Vatrt. March 26, 2019 - Game Seven!!! Make sure to make your way to Warren tonight for the deciding game seven of the SEMHL final series! Game time is 8 p.m. 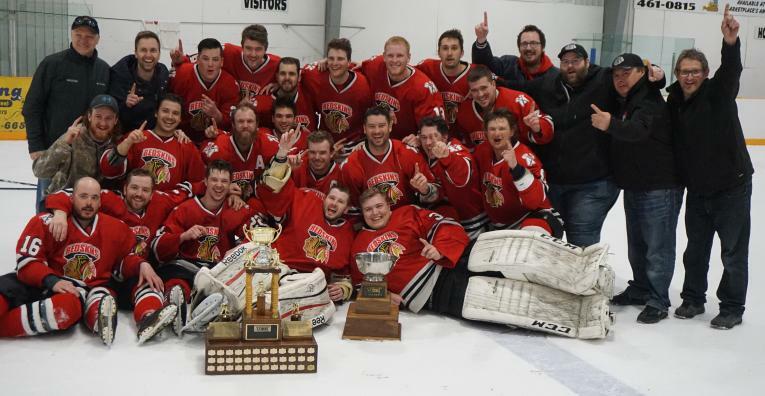 The champion will have a short break as the Senior Provincial Championships start this Friday night at 8 p.m. in Morris as the SEMHL champions will take on the Carillon Senior Hockey League champion Ste. Anne Aces. Morden is the place to be tonight as the Redskins look to add to their repretoire with another SEMHL title. The Mercs will have something to say about that as they look to head back to Warren on Tuesday night for game seven. Make sure to head to Morden tonight to cheer on your team! The league championship trophies will be in the house! As many expected, this years final series between Morden and Warren has become a best of three series as the home team has won each of the first four games. Team discipline has played a factor as well with the Mercs scoring three powerplay goals in their 10 chances while Morden has netted two in their 10 opportunities. Game five goes Thursday night in Warren and than back to Morden Sunday night for game six. Thursday night's game two in Morden was postponed due to hazardous road conditions. The game has now been rescheduled for Saturday, March 16th in Morden. Game time is still 8 p.m.
Game three will now be played on Sunday, March 17th in Warren. Game time is 4 p.m. 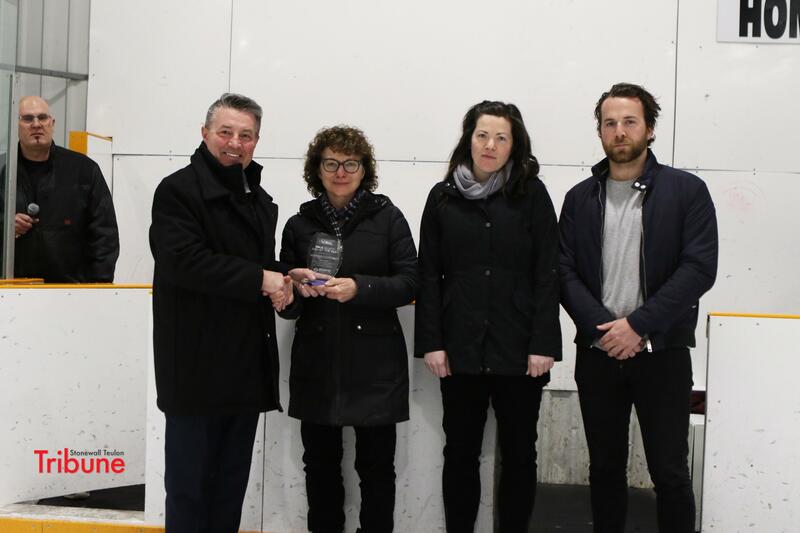 Prior to the start of last nights game one in Warren, the SEMHL Dale Rempel Man of the Year Award was presented posthumously to long-time league commissioner Wayne Deschouwer. On hand to accept the award from current league commissioner Tom Vatrt in his honour were his wife Clemence, and two of his children, Lisa and Eric. It all starts Tuesday night in Warren at 8 p.m. Head-to-head this season, Warren won two of the three games with one of those a shootout victory on November 8th. Morden's 10 goals in those games was only one less than the Mercs. The turning point in this series could come down to special teams as five of Morden's goals were on the power play versus two for Warren. In net, with their regular starter Dola injured (24 of 26 total games played plus a 1.18 playoff goals against average) Warren will be counting on Spittal to step up and carry the load. Morden looks to continue with Peters manning the crease. His 617 minutes played leads all playoff goaltenders. 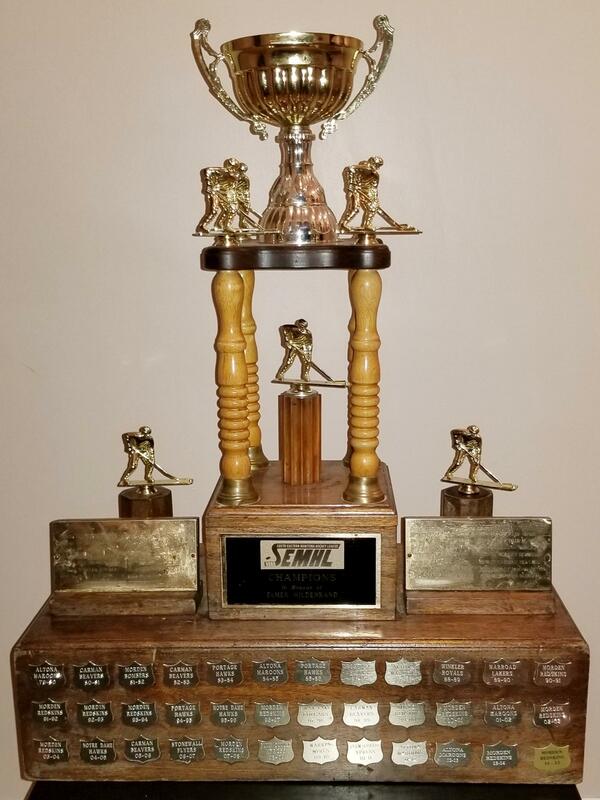 It`s down to two teams as the Warren Mercs and Morden Redskins will battle it out for SEMHL 2018-19 supremacy. Warren will be looking for their second league championship while Morden are looking to add to their 15 prior championships. 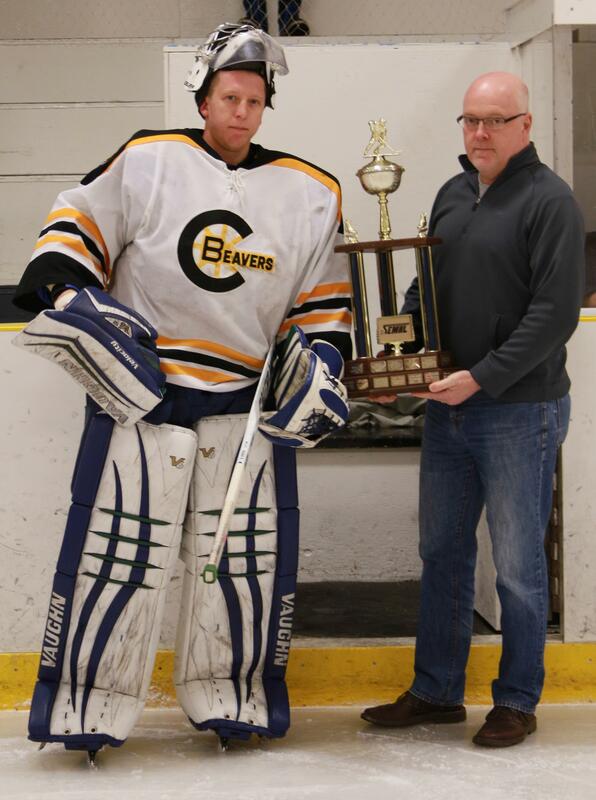 Congratulations to the Carman Beavers on topping the SEMHL during the regular season and to Steve Christie on being selected as the SEMHL's best goaltender. Accepting the regular season Bob Hamm Trophy on behalf of the Beavers is team captain Aaron Lewadniuk. Accepting the award for the SEMHL's best goaltender is Carman's Steve Christie. The Beavers should be well rested following their first round bye. Carman hasn't played since a February 6th loss to Notre Dame. They will need to shake off the rust quickly as they face a Morden squad who are in full playoff mode after dispatching Altona in the quarterfinals. With the leagues top four regular season scorers involved in this series (Carman-Owen and Dudar with 49 pts each, Morden-Rey 59 pts and Grove 44 pts), home ice and last line change/matchups should play a significant role and could prove to be the difference maker. Not to be forgotten is the goaltending as both teams possess puck stoppers that can turn a game in their teams favour. 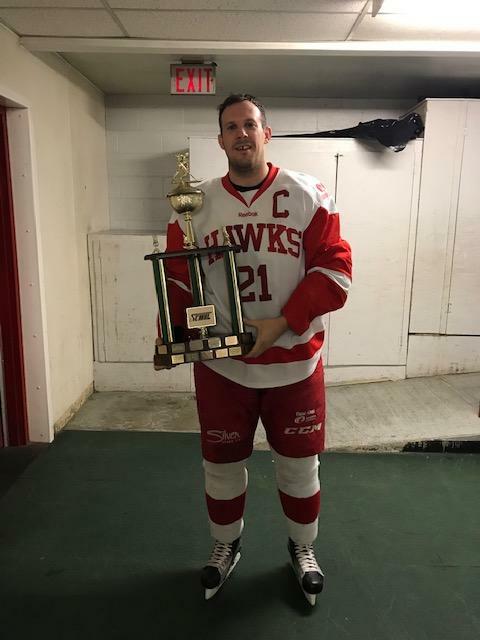 Christie is coming off a league leading 13 win season for the Beavers while Morden's duo of Peters and Wall (what better name for a goaltender?) combined for 12 wins. What more could be asked for in a playoff matchup? Warren and Portage both finished with identical 13-6-0-1 records with virtually the same home and away records. With the Mercs taking the five game season series three games to two, they not only placed second in the league but also gain the all important home ice advantage. Powerplays were effective for both teams as Warren went 6 for 18 (33%) and Portage was 5 for 16 (31%). A hot goaltender may make the difference with these formidable lineups. Dola will look to continue his winning ways in the Warren net where he went 3-1 in the regular season against Portage. Sviestrup won two of his three starts against the Mercs during the regular season. Congratulations to Dane Crowley of the Altona Maroons on being named the SEMHL's best defenceman. 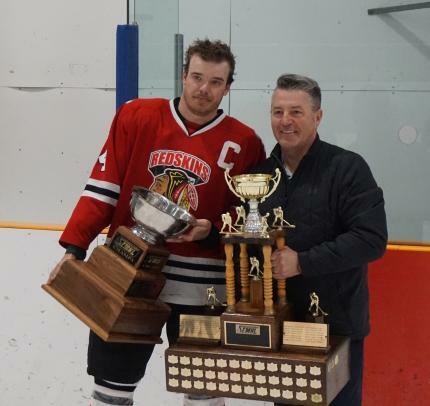 Congratulations to league MVP and scoring champion Mike Rey of the Morden Redskins. 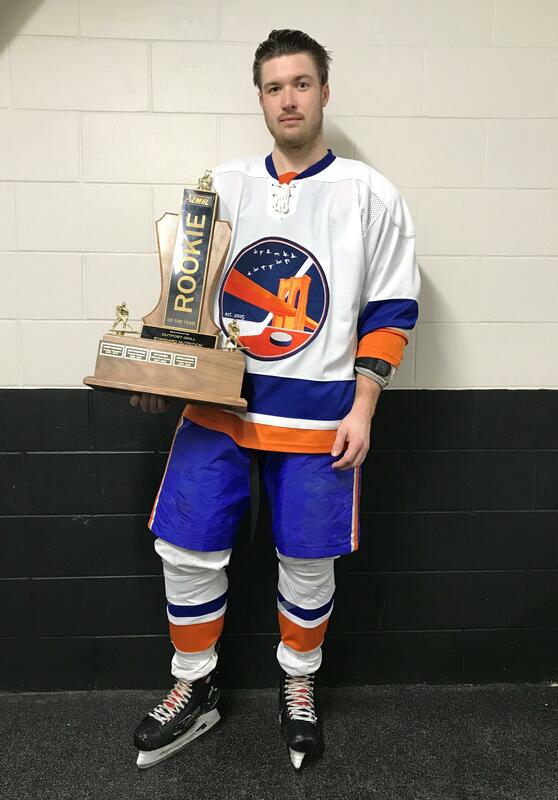 Congratulations to Derrick Brooks of the Portage Islanders on winning this year's Rookie of the Year award. The votes have been counted and teams will be awarding the various league awards at their home playoff games. Kicking it off last night. 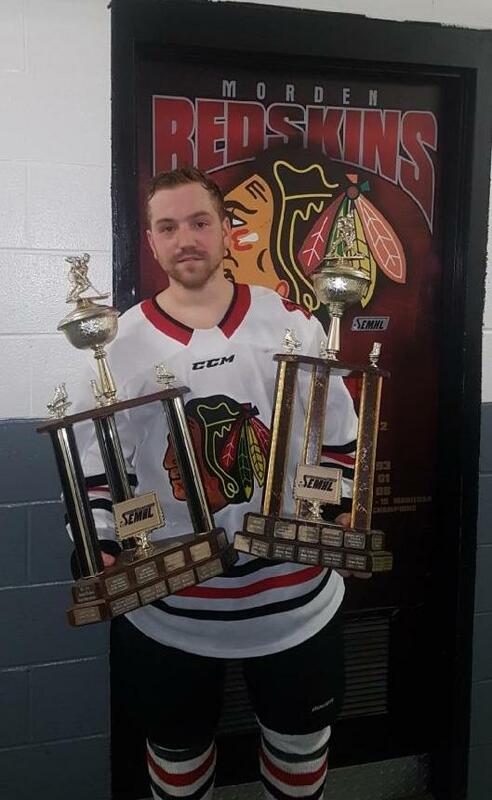 Steve Clark of Notre Dame was awarded the leagues Most Sportsmanlike Player trophy. Congratulations to all the players selected to the 2018/19 SEMHL All Star teams.Click here to view! When looking at the total goals scored between Morden and Altona in their four game regular season series (Morden 31 vs Altona 12) few would believe it was a series split. The Redskins opened the series with blowout wins but the Maroons would take the final two games with one goal margins. Both teams had their success on the powerplay as Morden went 7 for 12 while Altona went 4 for 15. Team discipline could wind up being the difference. In between the pipes, there were four separate victors in the regular season matchups as Morden's Peters and Wall and Altona's Janzen and Martel all chalked up wins. The third place Islanders versus the sixth place Hawks could turn into a closer series than the final standings would indicate. Portage won two of the three games between the teams during the regular season with only a four goal differential (12-8). Three of those Islander goals were on the power play (3 for 9) while the Hawks were shutout of special team goals (0 for 11). A successful powerplay could be the difference maker in this series. Sviestrup looks to continue his winning ways against Notre Dame, being the goalie of record in the two regular season Portage wins between the two teams. Timmerman will need to hold off the high scoring, and balanced, Portage attack for the Hawks to move on. In the battle of the W's, the second place Mercs take on the last place Royals in the first round. Warren had little trouble with Winkler during the regular season taking all three games with a combined score of 24-9. Special teams didn't make a big difference in the season series with the Mercs scoring four with the man advantage plus one short handed goal versus a single goal on the power play by the Royals. In net, Warren be counting on Dola to carry them through the post-season while Winkler will look to Wiebe to hold the fort. Check out the Playoffs page for all the first round matchups and schedules. 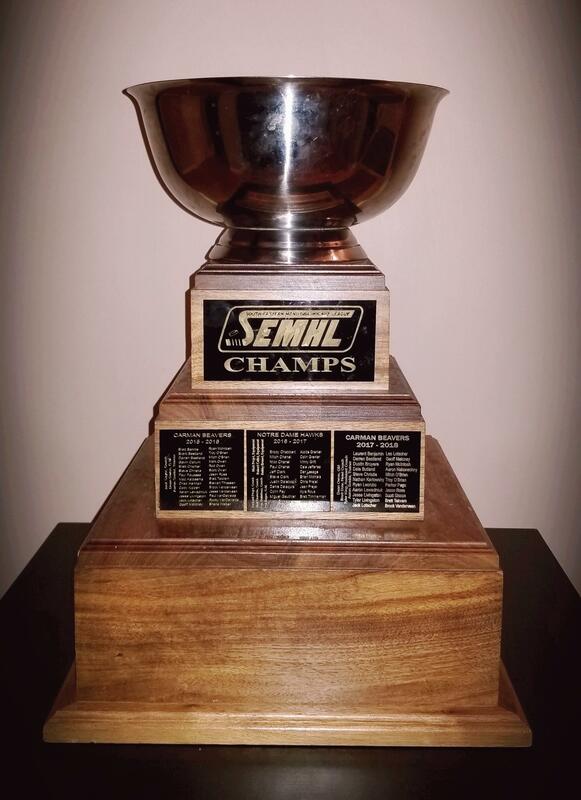 We'll have some first round playoff previews throughout the week so keep checking in to SEMHL.net! With only a couple of games remaining in the regular season schedule, the final standings are taking shape and first round playoff matchups look to be set. With finishing atop the standings, Carman will get the first round bye. Depending on the outcome of the Sunday, Feb 3rd Warren/Portage game, Warren could tie them in overall points but Carman won the season series between the two. Check back tomorrow night for a full listing of first round playoff matchups and schedule. The Wednesday January 23 game between the Notre Dame Hawks and Winkler Royals has been moved to Thursday January 24 at 8 p.m.
Jan. 16, 2019 - The Race for 1st! With only three weeks remaining in the regular season, the battle for the coveted first round bye is heating up and the intensity (and penalties) in recent games shows that. Rosters have been finalized and everyone is set for the playoff push. Stay tuned!! With a little over half the regular season completed, top spot is still up for grabs as only two points separates first and fourth place. It looks as though Carman, Morden, Portage, and Warren will be battling down to the wire. Please note that the December 22nd Morden at Notre Dame game has been rescheduled to Thursday, January 17th, 2019. Game time remains as 8 pm. Dec. 3, 2018 - Royals Back Home! Good news for the Winkler Royals as Winkler Arena is back up and running. There is a great article on Wayne Deschouwer in todays Winnipeg Free Press. Click here to read it. Due to the Winkler Arena shutdown, the Sunday, November 25th Winkler Royals home game against Morden has been moved to Morden. Game time is still 7:30 pm. News out of Winkler today that Winkler Arena will be shut down for up to four weeks for repairs to the ice plant. Click here for more info. Oct. 29, 2018 - 2018-19 Opening Weekend is in the books! Note: Due to Notre Dame using an ineligible player in the Sunday, October 28th game, as per rules, Winkler is awarded the win. All of the player statistics will stand as reported on the gamesheet.